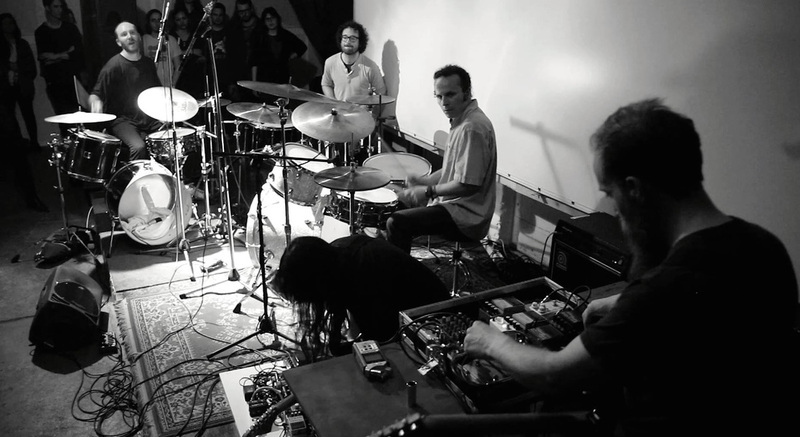 In May of 2014, Canadian experimental/ambient guitarists Aidan Baker (Nadja, B/B/S, Caudal) and Eric Quach (aka Thisquietarmy), who have frequently performed and collaborated together, recruited three drummers - David Dunnett (Canada), Jérémie Mortier (Belgium), and Felipe Salazar (Colombia) - to accompany them for a performance at NK in Berlin. The resulting performance—a freeform, semi-improvisational study in rhythmic, psychedelic, atmospheric spacerock—was documented as a CD release on Belgium's Consouling Sounds as HYPNODRONE ENSEMBLE. Following a second performance in September 2014 at Incubate Festival in Tilburg, Netherlands, HYPNODRONE ENSEMBLE, with the addition of Gareth Sweeney (Ireland) on bass, entered Golden Retriever Studios in Berlin to record a follow-up to their live debut. The results, edited down from several hours' worth of recorded material and mastered by James Plotkin (sunnO))), Oneohtrix Point Never, Isis), became this album The Shape of Space. It will be released as a limited LP (100 translucent vinyl, 400 black vinyl) by new Berlin label Calostro Recordings and on CD, in a hand-printed letterpress sleeve, by Manchester-based Little Crackd Rabbit Records. It’s a fitting progression from the debut album and shows the sextet coalescing into a powerfully rhythmic beast, ever-growing and ever-pulsating. DELUSIONS OF ADEQUACY: "A post-Krautrock work-out that imagines Can’s Jaki Liebezeit jamming with Tortoise’s John McEntire and Slint’s Britt Walford – which is almost as good as it sounds. The Shape Of Space is a dense and overwhelming construction built with carefully sculpted intent." THE ACTIVE LISTENER: "A master work of precision and improvisation that’s mesmerizing while remaining surprising in its turn. Highly recommended." LCR005 comes housed in LCR's standard hand-printed letterpress packaging and includes a numbercard unique to each copy. LP version available from Calostro Recordings here.